Renewing Antioxidant Treatment, your age-defying multi-defence system, helps you resist time and counteract harsh environmental threats! Exclusive ACR (Activated Cellular Response) technology stimulates skin cell metabolism and activates cellular renewal, to parallel youthful behaviour. Echinacea supports immune power, while antioxidant Vitamins E, C, A, and Green Tea extract intercept and neutralize free radicals that prematurely age skin. UVA/UVB sunscreens (SPF 4) help protect youthful structure. Renewing Antioxidant Treatment can change the way your skin ages. Applied over your daily moisturizer, this exclusive formula delivers the most effective age-defying ingredients and technical advances in the science of skin care today. With each day you use this Treatment, you do something important for the future of your skin - you delay aging. With every week, every month, every year you continue to reap the cumulative benefits of this outstanding achievement in youth protection. Start now to defy aging every single day with Renewing Antioxidant Treatment! The rate at which our skin ages is linked to basal skin metabolism and the environmental factors of UV radiation, available moisture and sufficient protective nutrients. These elements can be favourably influenced with a skin renewal treatment. To stimulate skin cell metabolism, encouraging plump, moist skin cells to rise nearer the surface, minimizing the appearance of fine lines and wrinkles. To help skin remain smooth and supple by preventing damage to collagen and elastin, the structural foundation of the skin. To reduce the damaging effects of UV radiation, both as an accelerator of aging and as a precursor to skin disorders. 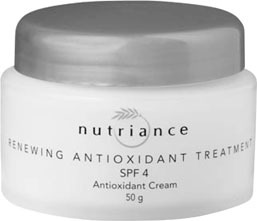 Why Nutriance Renewing Antioxidant Treatment? Ingredients: Water, PPG-2 Myristyl Ether Propionate, Octyl Methoxycinnamate, Tocopherol, Butylene Glycol, Myristyl Alcohol, Cetyl Alcohol, Stearyl Alcohol, Myreth-4, Ceteareth-15, Ceteareth-25, Decyl Oleate, Cetearyl Alcohol, Ceteareth-20, Butylene Glycol, Hydrolysed Milk Protein, Niacinamide, Adenosine Triphosphate, Hydrogenated Coco Glycerides, Isostearyl Isostearate, Avobenzone, Cetyl Alcohol, Dimethicone, Shea Butter, Olive Oil, Myristyl Alcohol, PEG-30 Stearate, Cyclomethicone, Retinyl Palmitate, Ascorbyl Palmitate, Green Tea Extract, Coneflower Extract, Xanthan Gum, Methyldibromo Glutaronitrile, Beeswax, Phenoxyethanol, Methylparaben, Ethylparaben, Propylparaben, Butylparaben, Fragrance, EDTA. Skin’s natural metabolism is enhanced with GNLD’s exclusive ACR (Activated Cellular Response) formula that gives skin a smoother and more youthful look in as little as 10 days, by erasing lines and wrinkles where they begin in the skin’s basal layer. Skin has a more supple feel from moist, fresh cells brought nearer to the surface, thanks to ACR’s specific combination of biological precursors including amino acids, vitamins and ATP (the primary component of cellular energy). No damaging chemicals or acids are employed. As ACR helps energized cells regenerate, new cells help rebuild underlying collagen and elastin structure, as verified by European clinical testing. Protects the skin’s suppleness and youthful structure from oxidative assault with lipid soluble Vitamins A and E, and water soluble Vitamin C. Clinically proven to increase cellular antioxidant capacity by up to 90%! Provides the fifth step of the Nutriance Synergy Cycle; a complete skin care programme in five steps. Each step	builds upon the last. Step Five leaves your skin youthful and resilient. Water soluble, oil-free formula helps maintain a healthy skin surface pH.